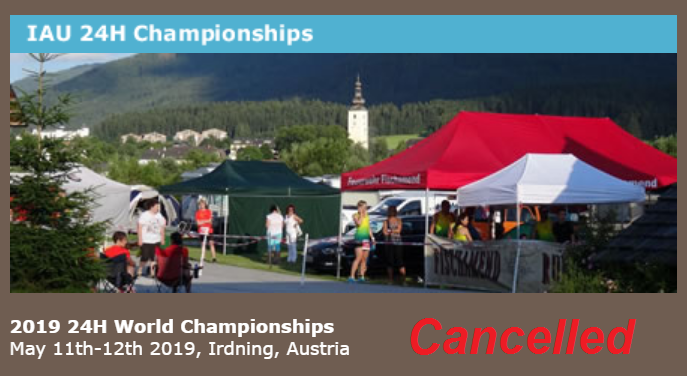 Cancellation of 2019 IAU 24H World Championship at Irdning, Austria. We are very disappointed to have to announce the cancellation of the 24H World Championships at Irdning, Austria for 2019. The LOC decided that they were unable to continue with preparations for the event due to financial constraints and have withdrawn from the contract. They announced their decision to us and to the Austrian Athletic Federation in the last two days and we hoped to have some discussion on the way forward. We will be investigating alternative venues with a matter of urgency.